Help, My Wood is Cracked! 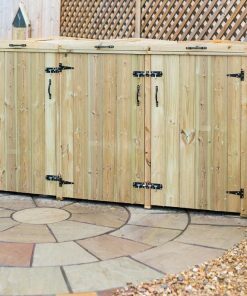 If you’re buying garden furniture or timber to build your own garden constructions, then you obviously want the best wood you can afford. 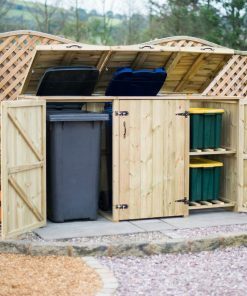 You want that bin store or shed or bench to last as long as possible. So it’s understandable that when splitting or cracking begins to show in timber that you become concerned. Is your shed going to fall down? Did you get ripped off buying that wood? Will your bench support your weight? However, there’s a lot of misinformation about split timber and we’d like to set things straight. So before you panic or tear down your new shed, keep reading to find out why cracked wood isn’t the disaster that you might think it is. Free Water: Free water is sort of floating around inside a tree, filling the spaces between cells (okay, it’s far more scientific than that, but that’s the basic idea). It can easily be sucked in through the ground to provide a tree’s leaves and fruit with nutrients, and just as easily expelled. Bound Water: Bound water is actually inside the cells of trees. This water is far more difficult to get rid of, since it’s trapped inside the cell walls. Once your timber has been cut, the free water leaves relatively easily. The bound water tends to stick around though. But Wait, Isn’t Timber Dried? But drying wood doesn’t remove all the moisture. It will remove most of the free water, but not the bound water. In fact, once dried, the timber will still have around 25% moisture content. And that’s a good thing. If you were able to remove all the moisture from wood it would become brittle and difficult to work with. That bound water helps make wood stronger and more flexible. Er, What Does All This Have to Do with Splitting? Wood is a natural element and it likes to be in harmony with its environment. In fact, as a material wood tries to reach an equilibrium wherever possible so that it’s the same temperature and has the same moisture content as its surrounding environment. You know this, you’ve felt wood that has been warmed by the sun, or wood that feels wet through and through due to a downpour. Wood works very hard to keep this equilibrium. When wood is dried it is dried in a certain environment (perhaps outside in a yard, perhaps in a warehouse), and so makes itself equal to that environment. But when conditions change, perhaps it rains more, or perhaps the sun shines down in a rare UK heatwave, the wood changes its structure in order to try and come to an equilibrium with new conditions. And this is where the problems begin. When the outside environment gets hotter, summer begins, and the sun starts to shine, your timber suddenly realizes that it’s out of whack with the surrounding environment. Outside is drier and hotter, and so timber also needs to become drier and hotter. And as moisture is sucked away to try and achieve that equilibrium, cracks and splits appear in the wood. Parts of the wood are shrinking in order to expel some of that bound water so that an equilibrium can be achieved. Wooden posts and rods are the most likely to suffer from cracking since they tend to be made from the “heart” of a tree. The outside rings of the fence post release moisture more easily, but moisture coming from the centre of a post has to work its way out, making for more splitting in the wood. But That’s Bad, Isn’t It? Sure, those cracks can look very worrying, they can be huge, especially in larger pieces of timber. But you have nothing to worry about at all. Why? Because they’re going to disappear. No, seriously, they will. Once an equilibrium has been achieved those cracks will close up. It’s not going to happen overnight and may take months or even years depending on how stable a climate the timber is in, but over time all those splits and cracks will close up again. Of course, they might open up again as well, particularly if the environment is quite unstable since the timber will again need to try and come to an equilibrium. You can’t prevent cracking and splitting from happening completely. It’s a natural process, and no matter what is done to the wood it will always occur. The only true alternative is to use different building material, but a stone shed is a lot harder to build, not to mention more expensive. There are a couple of things that can help minimize the problem, however. Firstly, a good treatment will help regulate how quickly moisture can enter and exit wood. The slower moisture is absorbed or expelled, the less likely the timber is to crack. Secondly, you can avoid exposing your timber to extremes of moisture and temperature. Keeping a bin store in a covered alley, rather than against the sunny back wall of a house, for example. Or bringing a garden bench into the garage during the winter months. Again, this won’t stop cracking completely, but the fewer extremes timber is exposed to, the less likely it is to crack. Cracking and splitting in timber is a natural and normal process and one that really can’t be completely prevented. The good news is that cracks will close up, and that the structural integrity or strength of your timber isn’t affected at all. No matter how much money you spend on wood, cracking will still happen, your timber is not defective. However, applying a solid preservative or finish to timber can help minimize splitting issues. Why Is My Wood Green? !